Buddy working on beautiful commission. SANTA FE, NM – July 20, 2017 – The Institute of American Indian Arts (IAIA) announces the Artist-in-Residence line-up for for the Fall 2017 semester. IAIA continues their series of month-long artist residencies which began in August, 2015. Native and First Nations artists have been selected to visit the IAIA campus in Santa Fe to make art and interact with both the campus community and the Santa Fe arts community. The program includes public receptions and artist talks from each of the artists. A selection committee of students, faculty, and staff reviewed applications for the Institute of American Indian Arts (IAIA) Artist-in-Residence (A-i-R) Program and selected artists for the Fall 2017 session. 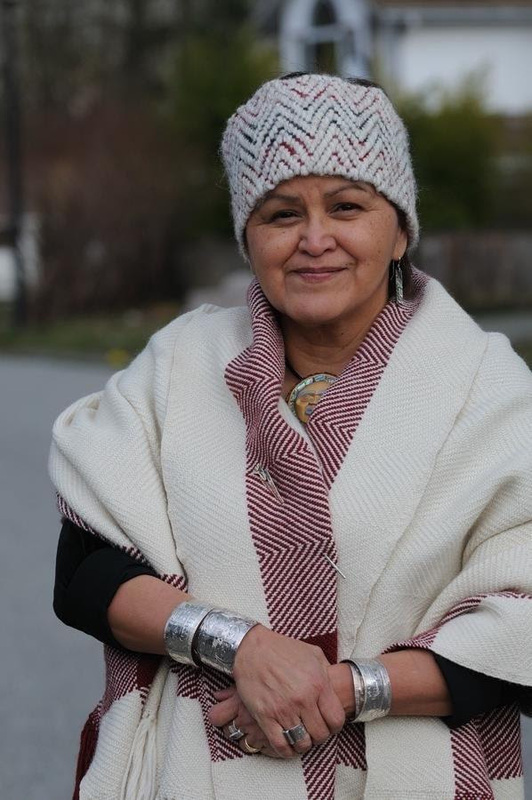 Janice George (Chepximiya Siyam), from Squamish Nation, Canada, is a master weaver andtextile artist who learned to weave from Coast Salish weaver Susan Pavel and Subiyay-t Bruce Miller of Skokomish in 2003. George has integrated Squamish teachings into her work from her late Grandmother Kwitelut-t Lena Jacobs and other Squamish ancestors. George states, “In this short time of my weaving life, a few of my mentors have left this earth. Their breath is carried on in the teachings I pass on. I feel and see the pride that comes from reclaiming our inheritance from our elders and ancestors when we weave and when we wear our beloved weavings. We are taught spiritual protection is part of what we are wearing and feel the love that is put in each hand movement it takes to make a robe.” George co-authored the book Salish Blankets, Robes of Protection and Transformation, Symbols of Wealth with Willard Joseph and Leslie H. Tepper. For the last twelve years, the artist has been teaching her textile skills across Salish speaking territory. She attended Capilano University, British Columbia, the Institute of American Indian Arts, Santa Fe, and interned at the Canadian Museum of History, Quebec.